Enzyme Inhibitors is a molecule which acts by binding to an enzyme reversibly or irreversibly and decreasing or completely inhibiting its catalytic activity. Enzyme inhibitors are made up of protein and they occur naturally. Since blocking an enzyme's activity alter a biochemical process and cause imbalance which may terminate and/or slow down a process. Enzymes are involved in metabolism they regulate various metabolic pathways. In insects and some animals natural enzyme inhibitors are produced and are used as defense system against predators. Majority of drugs to treat a number of chronic and/or life-threatening diseases are developed with a mechanism of action directed towards enzyme inhibition. Enzyme specificity and potency are the important factors considered while developing a drug. A high specificity and potency ensures that a drug will have few side effects and strong therapeutic effect. Also, enzyme inhibitors are used as diagnostic agent to screen various diseases. Factors driving global demand for Enzyme Inhibitors are its wide applications in pharmaceutical, agrochemical industries. Restraining factors for enzyme inhibitor market is patent expiry of various drugs. This report provides information on enzyme inhibitors market size for the year 2014-2016, and forecast of the same for year 2021. 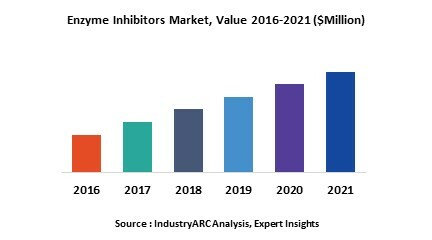 It also focuses on market drivers, challenges, restraints, market dynamics, growth indicators, competitive landscape, potential growth opportunities and other key aspects with respect to enzyme inhibitors market. The market for enzyme inhibitors is expanding with the rising incidence of enzyme based diseases and increasing research and development activities. In developed countries like US, Europe the market growth for enzyme inhibitor is high because of better diagnosis rate for the diseases, availability of medical facility, infrastructure, awareness and available treatment options. In Asia pacific region Japan, china and India are most potential markets due to economic development, improvement in medical facilities and growing population.